The Children's Ministry department provides a comprehensive ministry to children with year-round programs, special events and other activities. We love and value every child that comes to us as a precious child of God. He or she will be encouraged and trained in his or her early walk with the Lord. In addition, because we see all children in our surrounding communities as needing to know the Lord, there are many ministry endeavors that reach out to the community throughout the year. All children are welcome at FECC. If your child has a special need, please contact Director of Children's Ministries Mrs. Caroline Lao at (562) 865-8444. We would like to accommodate your child in the best way possible. Currently we have a program for special needs children on Sunday morning. If you have any questions or need more information, please contact Mrs. Caroline Lao at the church office. Vacation Bible School, or VBS, is a fun-filled program many churches offer, usually during the summer (“vacation”) months, to connect with the children and families in their communities. We warmly welcome your Children to our VBS Program. We invite you and your family to join us for VBS closing program and family fun night at 6 pm on August 5. 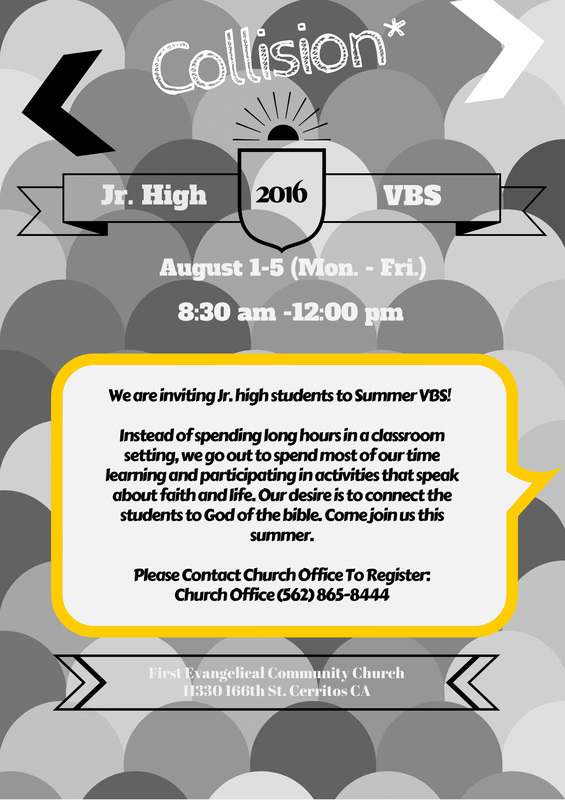 We are inviting Jr. high school students to summer VBS.